At the recent UN Commission on the Status of Women in New York, the Dominican Leadership Conference sponsored the side event, “From Objectification to Dignity: Images of Women in the Media.” Gender equality: He for She Campaign. Conversation and emphasis have been building on the indispensable role and potential of women in the international development sphere, seen clearly in the dynamic discussions that took place at this year’s Commission on the Status of Women (CSW). Delegates and passionate activists from around the world gathered to discuss the global state of women in relation to achievements and gaps of the Millennium Development Goals. There was general consensus for women to be represented more fully in data, greater focus on addressing violence against women, and increased access to education, health, and leadership at all levels (full text of agreed conclusions linked below). The vast majority of these voices were female. Women have been talking about gender violence prevention for a long time, and men have largely been outside of that conversation. Of course, there are many good men who do not participate in gender-based violence, but this is not enough to change the structure of oppression. In addition, gender violence is generally perceived as physical aggression of men against women. This is certainly true, and one in four women will experience domestic violence in her lifetime. But gender violence can also manifest in more subtle forms. The dignity of women is diminished in everyday sexist rhetoric, gender wage gap, lack of ownership of assets and productive resources, greater burden of unpaid care work in the home, etc. 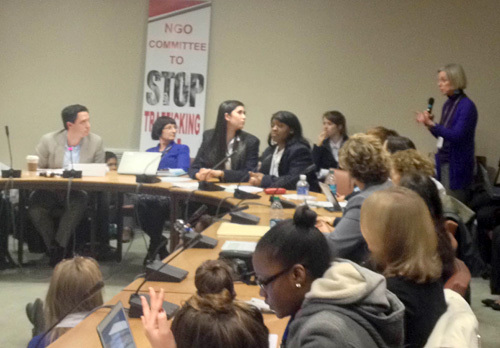 In fact, Dominical Leadership Conference sponsored and organized a panel discussion side event during this year’s CSW on the way media images dehumanize and objectify women. Another major challenge to the fight against gender inequality is that it has largely been framed as a “women’s issue,” which causes men to feel disengaged, or worse, excluded. Patriarchy still rules our society, and men are powerful agents of change. Their voices are necessary to lift up these issues and ultimately to transform structures of inequality. To realize these goals, men have the responsibility to pick up the torch, and integrate the conversations into male culture. As Dr. Jackson Katz articulates, “Men can say some things that women can’t say, or rather, men can be heard saying some things that women can’t be heard saying.” Vocally problematizing societal realities that disempower women takes leadership and courage, but the effects of such a paradigm shift would benefit not only women, but all members of society. The “He for She” video and social media campaign is an innovative approach to engaging men and creating a space to raise male voices for empowerment of women. Men such as Patrick Stewart, Matt Damon, Antonio Banderas and others have made strong statements advocating for women’s rights and opportunities as part of this initiative. Furthermore, I would like to note here one issue that I feel must be addressed in engaging men for this important cause. As part of the “He for She” campaign, Archbishop Desmond Tutu made the statement: “Men and boys, we show our manhood by how we treat our women, our girls, our mothers, our sisters.” This quote represents one strategy men use to personally engage with issues of women’s rights—through the lens of relationships with female family members. I do not presume to question the positive intentions of Archbishop Tutu, nor any other man who empathizes with struggles of women’s empowerment in light of women he loves. It is only natural that these issues seem more important and relevant if they have direct influence on the life of one’s daughter, mother, sister, etc. However, this frame is highly problematic. It presumes that women are only valid via their relationship with a man, as if their value is affirmed and dependent on their identity as a daughter, a mother, or a sister. This is an example of the blindness of privilege, which occurs when often the dominant group is unaware of their own dominance. The dignity and worth of a woman is an entity independent of the men in her life. Her rights should be upheld and respected not because she is a wife, or even a woman, but because she is a human being.